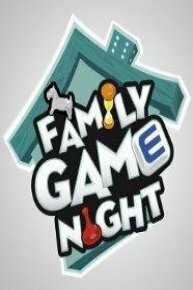 Family Game Night is a game show that pits two families against each other in competitions modeled after various board games manufactured by the toy company Hasbro. The show premiered in October of 2010 and is hosted by Todd Newton. Family Game Night is 60 minutes long and separated into several segments. For the first two seasons, pre-selected families of four - two adults and two children - were introduced to the audience through a series of home videos. This was followed by a toss-up challenge where the families needed to answer as many questions as possible in order to determine who went first or second in the upcoming challenges. In the third season the format of Family Game Night was tweaked, resulting in families of varying sizes being chosen from the studio audience. After the toss-up, families compete against in each other in four to five challenges, each themed to a Hasbro-based game. For example, in Operation Relay families attempt to pull life-size versions of the Operation game pieces from a large version of Cavity Sam. In Twister Lights Out the competitors - kids first, adults next - attempt to keep their hands and feet on the lighted Twister circles without losing balance. In the first two seasons the winning families would collect Monopoly Crazy Cash Cards. At the end of the show these cards were placed in the Crazy Cash Machine, where families could win up to $25,000. In the third season the reward for winning challenges is to grab combination codes to open the Community Chest. Whichever family has the code heads to the Crazy Cash Machine. Produced by Zoo Productions and Hasbro Studios, Family Game Night airs on the American Cable Network the Hub. Families play a variety of games for cash and prizes. Celebrity edition with Tracey Gold. Celebrity edition with Niecy Nash. Celebrity edition with Jon Heder. Families compete in competitions based on popular board games. 6 families come together to compete with larger-than-life games in an hour of family fun. Two families compete in competitions based on popular board games. In the fourth season premiere, two families compete in competitions based on popular board games. Family Game Night is currently available to watch free on Tubi TV and stream on The Hub. You can also stream, download Family Game Night on demand at online.